La Rue Martin, Jr. | The Leverage Network Inc. La Rue Martin, Jr. – The Leverage Network Inc.
As a Community Relations Manager/Public Affairs Manager for UPS, La Rue Martin, Jr. is responsible for community service activities, charitable grants and donations, congressional relations and supplier diversity. A native of Chicago, La Rue graduated from De La Salle High School and earned a bachelor’s degree from Loyola University, where he was a two-time All-American selection in men’s basketball and Loyola’s all-time leading rebounder. His number 20 basketball jersey was retired in 2002. In 1972, La Rue was drafted by the Portland Trailblazers and played four years in the NBA. La Rue began his career with UPS in 1987 as a delivery driver in Portland, Oregon, and was promoted to a supervisor that same year. After various supervisory assignments in customer service and human resources, he was promoted to manager in 1990. 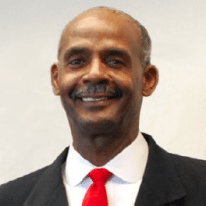 La Rue has received numerous awards for his service to the community, among them are the Leadership in Community Relations Award from the Human Resources Development Institute, Chicago Urban League Beautiful People Award, Dr. Martin Luther King Jr. Legacy Award, and the Black Heritage Award. La Rue’s board memberships and civic affiliations include City Club of Chicago, YMCA Mentoring Program, the African American Advisory Council of the Cook County State’s Attorney’s office, the Urban League of N.W. Indiana, M.L.K. Boys and Girls Club of Chicago, The Leverage Network, NBA Retired Players Association Board of Directors, and De La Salle H.S. Board of Directors.